Saturday, May 9 from 9am until 5pm or later if necessary. First Strike Paintball is field paint only. Practice grade paint is available for $35 a case and mid-grade paint is available for $45 a case. Concerns from teams or players that have paint deals or sponsorship will be addressed on a case by case basis. Contact First Strike Paintball to ask any questions concerning paint. Prizes: We are going to have prizes for the "Top Gun" at the clinic and the player that is the "Most Improved". We may also hold a raffle. As featured on the PSP Phoenix webcast and in PB3X magazine, TBD Fierce is one of the most successful divisional paintball teams in recent history. Owner and team captain Dan Rankin has guided TBD Fierce to countless 5-man amateur and novice state titles, the 2008 national and world title in division 2 Xball, The 2008 division 3 PSP World Cup title, and the 2008 Spyder Cup championship. With the help of pro coaching, the TBD Fierce program currently develops players from a wide-range of skill levels and experience that compete in PSP division 1 through division 3 Xball. TBD Fierce is looking to grow paintball in Florida by offering affordable clinics that teach sound fundamental paintball skills and also provide tips for building a successful paintball team. TBD Fierce wants to pass the knowledge they have acquired from building a successful paintball program to local players all over Florida. 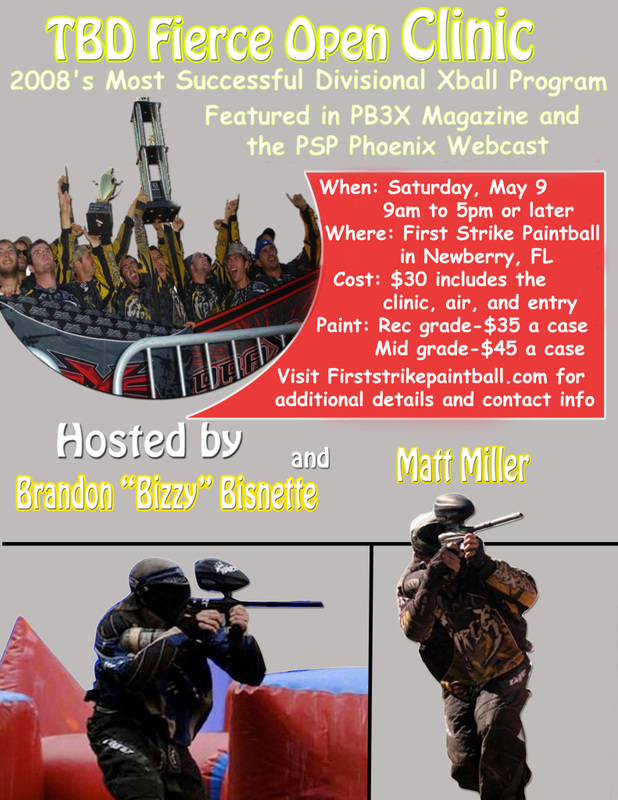 The first TBD Fierce clinic will be held Saturday, May 9 at First Strike Paintball in Newberry, FL. The open clinic is appropriate for entry level players wishing to learn basic skills and players with tournament experience who want to succeed at the national level. The clinic will be taught by Brandon "Bizzy" Bisnette and Matt Miller from the D1 TBD Fierce team. Bizzy has been competing at the highest level of divisional paintball for more than 8 years. A long-time member of Jax Warriors, Bizzy joined TBD Fierce in 2008 and used his experience to guide the team to the PSP division 2 national championship. Matt Miller is a local player from North Florida, who joined Fierce in 2007 and has successfully climbed through the divisional ranks with the team ever since. Known within TBD Fierce for his work ethic and preparation, Miller wants to provide young players with the tips that helped him rapidly improve. Bizzy and Miller will share the practice strategies, drills, and tips that have helped the team succeed. Come learn the keys to winning at the divisional paintball level from players who have experienced it first-hand!